Daily Debate: Can a Zelda Story be Too Silly for the Official Timeline? Daily Debate: Has the Official Timeline Helped or Hurt Fan Theories? Gossip Stone: How Important Is The Zelda Timeline To You? Spoiler warning for Skyward Sword. YouTube user GamesBrained, the brilliant mind behind Zelda 101, has decided to explain the complicated Zelda timeline in a three-part video series. The first one, recently released, covers The Creation Era when the three goddesses created the Zelda universe as well as the Triforce. Should the Zelda Series and Hyrule Warriors Remain Canonically Separate? Zelda series spent many years atop the mountain of gaming mysteries. Devoted fans spent hours, weeks, even months of their lives trying to crack the code behind the Zelda timeline, in the process forging complex and convoluted theories from the most minute of details in order to prove their own unique take on how the games all tied together. 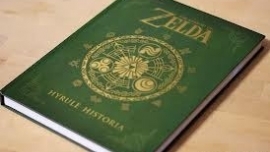 Of course, Hyrule Historia put an end to all that, but I bring this up because it shows just how much some people (myself included; I was a timeline theorist for years) love to find the connections between various parts of the series. Hyrule Warriors‘ release is almost upon us in North America. Relatively early on, the game was confirmed to have absolutely no connection to the main Zelda series—sure, the title features numerous characters, locales, items, and enemies from a select number of the games, but it’s all taking place in another parallel world that does not intersect with the ones Historia gave us. But was that the right call, and, assuming that the Dynasty Warriors/Legend of Zelda crossover gets a sequel, should Nintendo and Koei Tecmo continue to keep the worlds separate? Head past the jump to hear my thoughts on the matter. Daily Debate: Does Canon Matter? When it comes to comics and films, both use the same source material but often diverge into what some call the comic canon and the movie canon. Hyrule Warriors is a new Zelda game that takes elements from Zelda but uses it in a way that just doesn’t quite work in the Zeldaverse we’re so familiar with, and Zelda series producer Eiji Aonuma is not one to overlook this small fact. In an interview with Eiji Aonuma, it was confirmed that Hyrule Warriors is indeed not part of the main Zelda timeline. 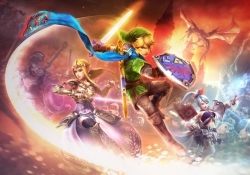 Relating it to the film The Avengers, Aonuma stated that while there is a connection between Hyrule Warriors and the Zeldaverse, Hyrule Warriors is moreover part of a different dimension. This is unlike Majora’s Mask which Aonuma states, while in a different dimension, is part of the main timeline. Looks like Link was never dead after all. Head past the jump for the interview snippet! This is a comparison of every main-line Zelda game on how they performed, how well they sold, and how long it took to complete. These are nobody’s opinions or arguments about these result- just straight down to the numbers.This table was put together by a site called ScoreGods and have really outdone themselves with the statistics. Hit the jump for more!